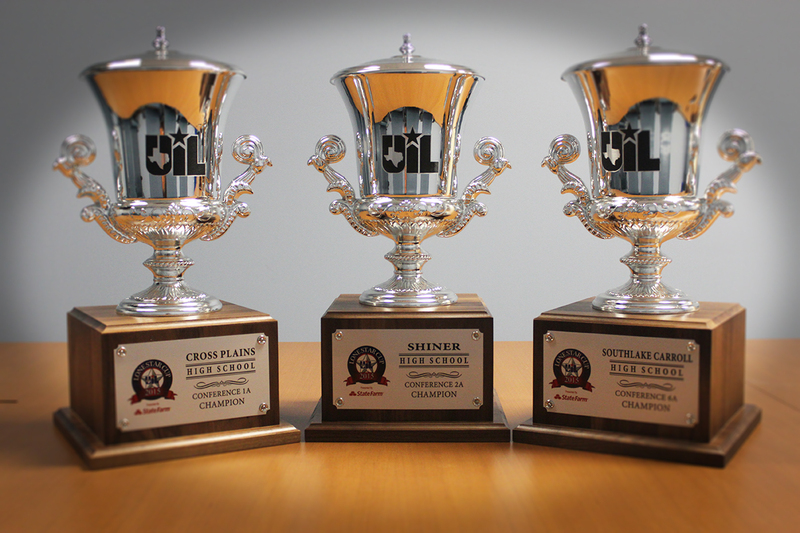 AUSTIN, TX— The University Interscholastic League will honor Cross Plains High School, Shiner High School and Southlake Carroll High School on Friday, Sept. 11 for winning the 2015 UIL Lone Star Cup presented by State Farm. A UIL representative will present each school with the UIL Lone Star Cup trophy and $1,000 scholarship for winning the prestigious award. The UIL Lone Star Cup trophy presentations will take place during a football pep rally inside the Cross Plains High School gymnasium at 2:45 p.m., Friday, Sept. 11. UIL Assistant Athletic Director Darryl Beasley will be on hand to make the presentation. With a co-state championships in girls track and field, and a state runner-up finish in academics and one-act play, and a regional semifinalist in girls basketball, Cross Plains earned 43 total UIL Lone Star Cup points for the 2014-15 school year. This is the first UIL Lone Star Cup victory for Cross Plains High School. The UIL Lone Star Cup trophy presentation will take place prior to Shiner’s varsity football game against Goliad High School at Comanche Stadium at 7:30 p.m., Friday, Sept. 11. UIL Assistant Athletic Director Peter Contreras will be on hand to make the presentation. With state championships in marching band and softball, and a top 5 finish at state in girls track and field, Shiner earned 60 total UIL Lone Star Cup points for the 2014-15 school year. The Comanches also earned points in UIL volleyball, football, girls and boys basketball, academics and baseball. This is the third UIL Lone Star Cup victory for Shiner High School. The UIL Lone Star Cup trophy presentation will take place prior to Southlake Carroll’s varsity football game against Midland Lee High School at Dragon Stadium at 7:30 p.m., Friday, Sept. 11. UIL Director of Athletics Dr. Susan Elza will be on hand to make the presentation. With state championships in boys cross country, golf and swimming and diving, and a fourth place finish at state in girls cross country, Southlake Carroll earned 100 total UIL Lone Star Cup points for the 2014-15 school year. The Dragons also earned points in UIL team tennis, volleyball, football, girls basketball, girls and boys soccer, academics, softball and baseball. This is the sixth overall and fourth-consecutive UIL Lone Star Cup victory for Southlake Carroll High School. Presentations for 2015 UIL Lone Star Cup winners Brock, Argyle and Austin Vandegrift will occur later this fall.